Welcome to SOA’s gallery of past Archives Month posters! 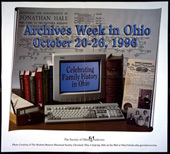 SOA has celebrated Archives Month/Week since 1993 and printed its first poster in 1994 (changing from week to the month-long observance in 2007). Also view our posters in Pinterest. 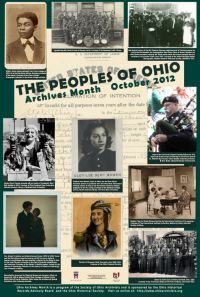 The 2012 Archives Month poster commemorates our theme, The Peoples of Ohio, with their rich tapestry of varied activities and cultures contributed by many groups over time. 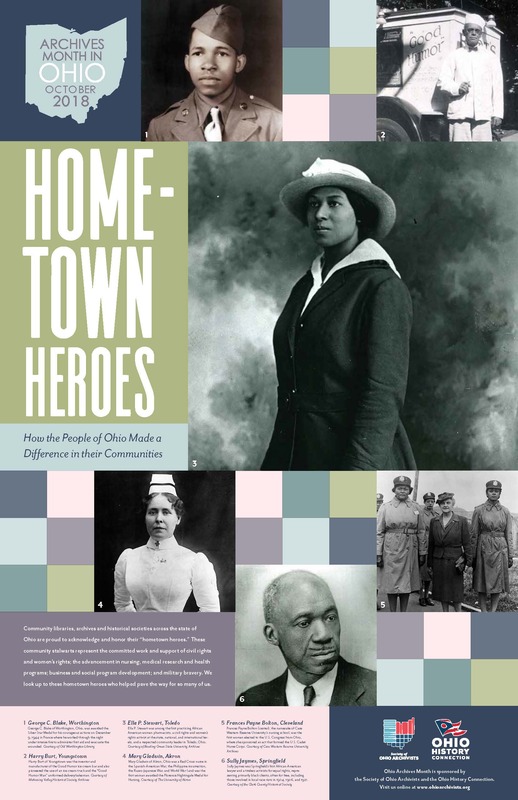 Images for the poster were provided by the Barberton Public Library, the Cleveland State University Michael Schwartz Library, the Franciscan Sisters of the Poor Archives, the Hiram College Library, the Mahoning Valley Historical Society Archives, the Ohio Historical Society, the Ohio State University Health Sciences Library Medical Heritage Center, the Ohio University Libraries Mahn Center for Archives and Special Collections, the University of Akron Center for the History of Psychology Archives of the History of American Psychology, the University of Cincinnati Archives & Rare Books Library, and the Western Reserve Historical Society. 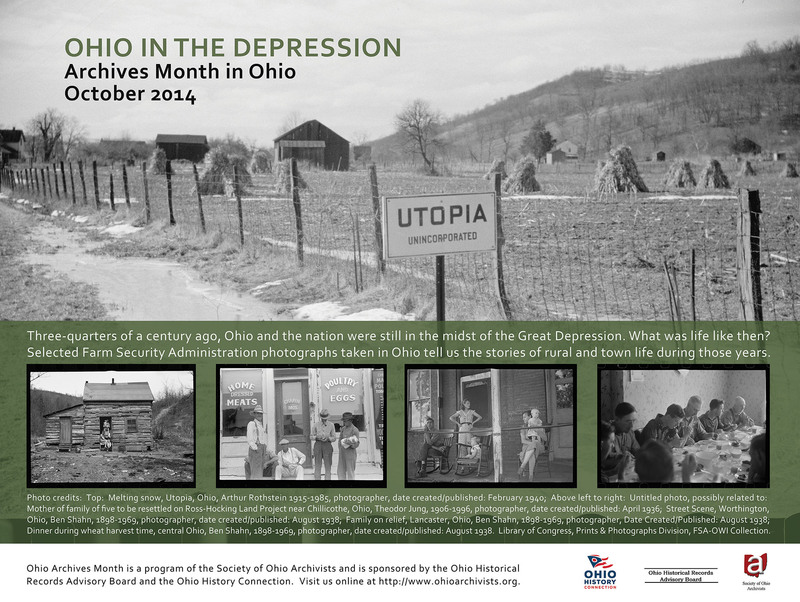 The poster was designed by Tutti Jackson of the Ohio Historical Society. The full-size PDF version is also available. 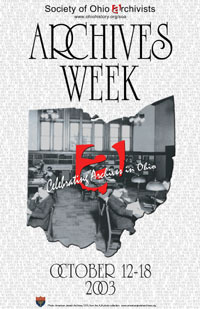 The 2011 Archives Month poster commemorates the sesquicentennial of the Civil War which began in 1861 and the many parts Ohioans had in the conflict. Images for the poster were provided by the Dayton Metropolitan Library, Denison University Archives, Hudson Library & Historical Society, Jacob Rader Marcus Center of the American Jewish Archives, Kenyon College Special Collections, Mahoning Valley Historical Society, Ohio Historical Society, Sandusky Library, and University of Cincinnati Archives & Rare Books Library. 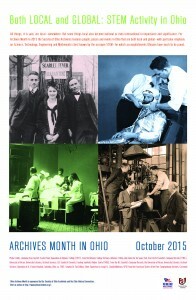 The poster was designed by Tutti Jackson of the Ohio Historical Society. The full-size PDF version is also available. 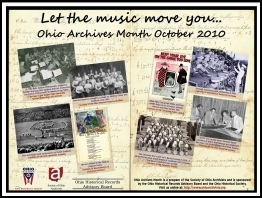 The 2010 Archives Month poster celebrated music in the archives. 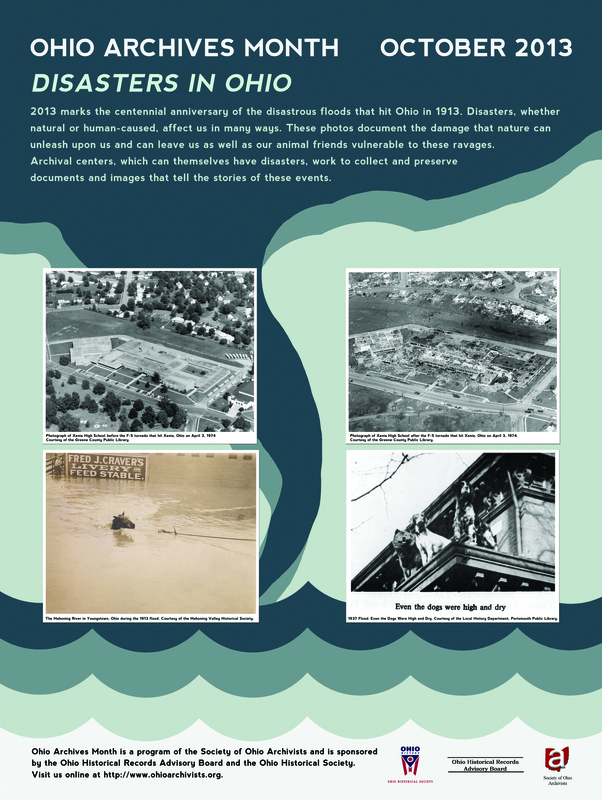 Images for the poster were provided by the Cleveland Public Library, Denison University Archives, Ohio Historical Society, the Sandusky Library, University of Cincinnati Archives, University Archives at Case Western Reserve University, and Wright State University Special Collections and Archives. 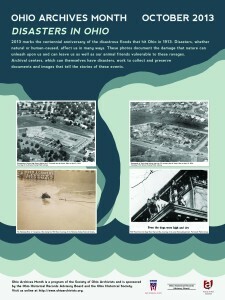 The poster was designed by Lisa Wood and Jillian Carney of the Ohio Historical Society. The full-size PDF version is also available. The theme of the 2009 poster was designed to complement the upcoming sesquicentennial of the Civil War and in honor of the 150th anniversary of John Brown’s raid on Harper’s Ferry (October 16, 1859). How did Ohioans participate in the abolition movement? Who were notable, and not-so-well-known abolitionists? 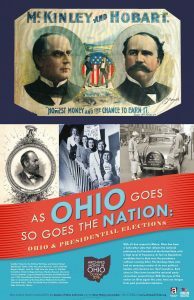 What were some of the important people/places/events in Ohio? The full-size PDF version is also available. 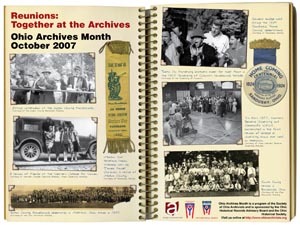 The 2008 Archives Month poster was designed to complement the 2008 presidential elections. 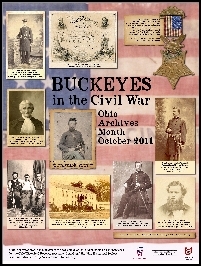 Images for the poster were provided by the Logan County Historical Society, the Western College Memorial Archives at Miami University, the Ohio Historical Society, the Sandusky Library, the University of Cincinnati, and the University Archives at Case Western Reserve University. The full-size PDF version is also available. 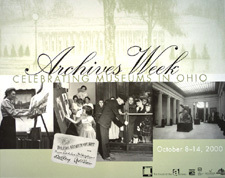 The 2007 poster was designed by Angela O’Neal and Louise Jones of the Ohio Historical Society. Images were provided by the Logan County Historical Society, the Western College Memorial Archives at Miami University, the Ohio Historical Society, the Sandusky Library, the University of Cincinnati, and the University Archives at Case Western Reserve University. The full-size PDF version is also available. The images for the 2006 poster were provided by the National Afro-American Museum and by Central State University Archives. 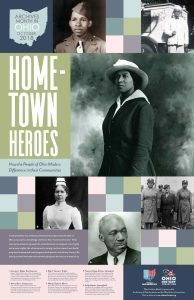 The poster was designed by Shelia Darrow at Central State University Archives, Wendy Felder at the National Afro-American Museum, Lonna McKinley at the National Museum of the United States Air Force, and John Luchin III, a graduate student in Humanities at Wright State University. 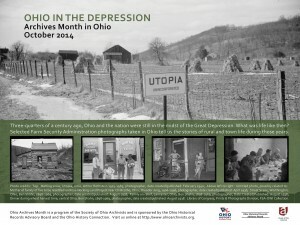 This poster was submitted by the Ohio Historical Society. The full-size PDF version is also available. This poster was designed by Jolyn Taylor of the Hudson Library & Historical Society which won the 2004 Ohio Archives Week poster contest. This poster celebrates archival organizations throughout the state of Ohio. Not only is Ohio home to hundreds of high-quality archives, but the impact of these archives on the documentation and preservation of Ohio’s heritage is inestimable. 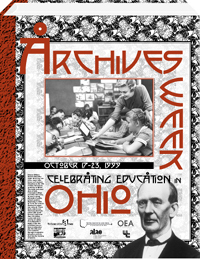 This year’s poster was was designed by Phil Reekers of the American Jewish Archives, which won the 2003 Ohio Archives Week poster contest. The full color poster measures 11″ x 17″. The graphic above symbolizes the important bridges that archival organizations build between the world of work and the preservation of its legacy for future generations. This image can be used as a heading banner for flyers or cut down to use as bookmarks. Click the image to get a larger jpeg that can be saved, scaled if necessary, and printed from a graphics program like Photoshop. Output at 300dpi, the larger jpeg will fit comfortably within an 8 1/2″ wide area. Meant for color printers. The poster focuses upon the place the media have in our society. It shows photos related to the Cleveland Press Collection (with some 500,000 images and 1 million newspaper clippings) now housed with Special Collections in the Cleveland State University Library. The poster shows photos of routine newspaper operations, news photos of local broadcast programs, and in the background an image of the front page that reported the catastrophic crash of the Hindenburg zeppelin in New Jersey in 1937. The Cleveland Press (1878-1982), part of the Scripps Howard chain, was Ohio’s largest newspaper for many years of the 20th century. The poster measures approximately 17″ by 22″ (or 43 by 56 cm.) in size. It is printed in black-and-green ink on white paper. 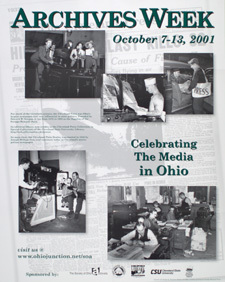 The poster was produced by the archival and graphic design staffs of the Cleveland State University and printed by the Orange Blossom Press of Cleveland. 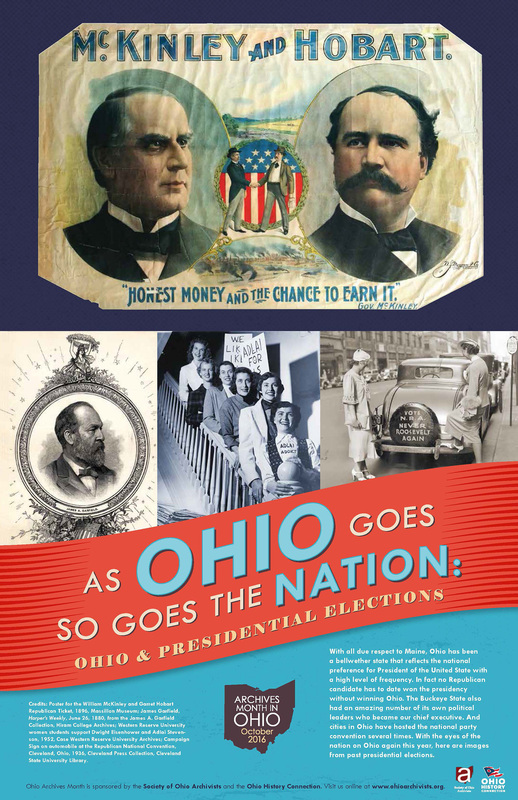 SOA appreciates the contributions of its partners with this year’s poster, particularly the Ohio Newspaper Association, along with the Ohio Library Council and the Orange Blossom Press. The poster focuses upon the place museums have in our society. It shows the beautiful architectural style of the Toledo Museum of Art along with photographs of its patrons, especially youngsters, over the years. It also notes, through the membership card signed by industrialist E.D. Libbey, the important local context of the glass industry in the museum’s history. The Toledo Museum of Art will proudly observe its centennial in 2001. The poster measures 17″ by 22″ (43 by 56 cm.) in size. It is printed in black ink on white paper with a light green accent color. The poster was produced by the archival and graphic design staff of the Toledo Museum of Art and printed by the Homewood Press of Toledo. 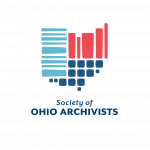 SOA appreciates the contributions of its partners with this year’s poster, particularly the Ohio Historical Society (and the Ohio Association of Historical Societies and Museums) and the Ohio Museums Association, along with the Ohio Library Council and the Homewood Press. The poster focuses upon education in Ohio with a particular emphasis on William Holmes McGuffey (1800-1873). Known for his famed Eclectic Readers of the 19th century and a strong advocate of public school systems, McGuffey also served as professor at Miami University and president of Cincinnati College and Ohio University. With a mid-20th century classroom scene inset, the poster has a photograph of McGuffey and uses one of his readers as a backdrop. The poster measures 17″ by 22″ (43 by 56 cm.) in size and is a red and black color duotone print. The poster was produced by the staff in the Rare Books & Archives Department, University Libraries, and the graphics department at the University of Cincinnati. SOA appreciates contributions of its partners, the Ohio Education Association, the Ohio Council for the Social Studies, the Ohio Library Council, and the Academic Library Association of Ohio. The poster focuses upon women’s history with a full length photographic portrait of a silent screen actress along with a series of inset photographs of women in many, varied roles, from visiting nurses and policewomen to factory workers and students, all from the holdings of the Special Collections and Archives department in the Paul Laurence Dunbar Library at Wright State University. The poster measures 15″ by 34″ (38 by 86 cm.) in size and is a red and black color duotone print. The poster was produced by the staff in the Special Collections and Archives department and the University’s graphics department. SOA appreciates the contributions in support of the poster including the Ohio Women’s Policy and Research Commission, the Ohio National Organization for Women, the Ohio American Association of University Women, Delta Kappa Gamma – Alpha Delta State and the Ohio Library Council. The paper for the poster was donated by Fraser Papers. 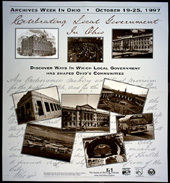 The poster focuses on buildings for and functions of local government in the City of Cleveland and Cuyahoga County. It suggests the many and varied services of government including health care, transportation, recreation and libraries. SOA and its co-sponsors, the County Commissioners Association of Ohio, the Ohio Municipal League and the Ohio Library Council, encouraged Ohioans to learn about units of local government in their community October 19-25 and to preserve and protect their valuable records. The poster is 17″ by 19″ in size. Its mixture of black and brown colors suggests the sepia tone sometimes used in older photographic prints. It was produced by staff in the Office of the Clerk of Cleveland City Council. SOA appreciates contributions in support of the poster. These have come from the County Commissioners Association of Ohio, the Ohio Library Council, the Ohio Council of Ohio Officials, the Ohio [County] Recorders Association, the Buckeye State Sheriffs’ Association, and the city of Cleveland. The poster focused on materials from the collections of the library of the Western Reserve Historical Society in Cleveland. It showed documents with family information along with library reference publications, and featured a computer, a new tool tremendously helpful to genealogical researchers. The Western Reserve Historical Society has an excellent collection of materials available for genealogical research. The poster is a full color print measuring 19″ by 25″ in size. It is produced from a specially made photograph created by the society’s curatorial and graphics staff and printed on coated stock. The paper for the poster has been donated by the Mead Paper Company. SOA appreciates contributions in support of the poster. 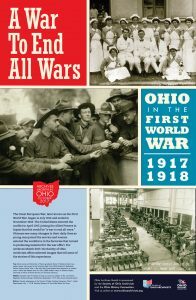 As of September 1, the Ohio Genealogical Society; its Delaware County, Hamilton County and Morgan County chapters; and the Delaware County Historical Society have made contributions for the printing. SOA will acknowledge these, and additional contributions as well, in future publications. 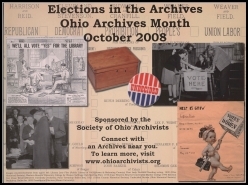 SOA, along with the Ohio Genealogical Society (OGS) and its many chapters encouraged Ohioans to learn about their families October 20-26 and to take steps to preserve and protect valuable documents. The poster focuses on materials from the collections of the Archives & Special Collections department in the Ohio University Libraries and the Meigs County Pioneer & Historical Society. It reproduces excerpts from letters and documents about Athens County soldier Walter Ervin, who was a prisoner of war in Europe; a photograph of a Meigs County soldier standing beside an army truck; and in the background excerpts from letters by a Meigs County sailor. 1995 was the 50th anniversary of the conclusion of World War II. SOA encouraged veterans and families of veterans to consider placing personal documents — letters, photographs, other textual items – into an archival repository. The poster is a duotone print measuring 18″ by 24″ in size. It is produced from digitized files and printed on coated stock. It is foldered in the pattern of the V-Mail letters of World War II. O.U. graphic design student Abby Burnworth designed the poster with the assistance of the Instructional Media & Technology Services department, Ohio University Libraries. This poster features a photograph of a baseball team from the McIntire Children’s Home, Zanesville, from Ohio McIntire Children’s Home Small Picture Collection at the Ohio Historical Society. 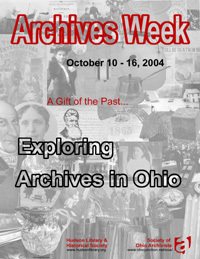 This was the first in the series of Archives Week posters. Jobe Morrison, Vice President and General Manager of Cross Pointe Paper’s Miami Mill in West Carrollton, Ohio, generously donated the paper for the poster. Questions or comments? Email the Public Information Committee.